Explore Brisbane's surroundings by going to Warner Bros. Movie World (in Oxenford) and Sea World Theme Park (in Main Beach). There's still lots to do: walk around South Bank Parklands, stop by Noosa Chocolate Factory, find something for the whole family at Wheel of Brisbane, and take in nature's colorful creations at City Botanic Gardens. For photos, traveler tips, and more tourist information, go to the Brisbane vacation planner . Beijing, China to Brisbane is an approximately 15-hour flight. You can also do a combination of train and flight. Traveling from Beijing to Brisbane, you'll lose 2 hours due to the time zone difference. Expect colder temperatures when traveling from Beijing in July; daily highs in Brisbane reach 24°C and lows reach 11°C. 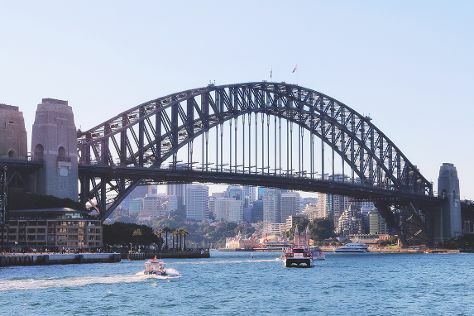 Finish up your sightseeing early on the 22nd (Mon) so you can travel to Sydney. Spend the 25th (Thu) exploring nature at Sydney Harbour National Park. There's still lots to do: snap pictures at Sydney Harbour Bridge, see a show at Sydney Opera House, take in nature's colorful creations at Royal Botanic Garden Sydney, and enjoy the sand and surf at Manly Beach. For photos, maps, where to stay, and more tourist information, use the Sydney sightseeing planner. You can fly from Brisbane to Sydney in 4 hours. Other options are to do a combination of bus and flight; or drive. In July, plan for daily highs up to 21°C, and evening lows to 9°C. Wrap up your sightseeing on the 27th (Sat) early enough to travel to Melbourne. Melbourne is known for museums, shopping, parks, zoos & aquariums, and nightlife. Your plan includes some of its best attractions: take in nature's colorful creations at Royal Botanic Gardens, enjoy breathtaking views from Eureka Skydeck 88, explore and take pictures at Docklands Stadium, and steep yourself in history at Shrine of Remembrance. For photos, other places to visit, where to stay, and more tourist information, you can read our Melbourne holiday tool . Getting from Sydney to Melbourne by flight takes about 3.5 hours. Other options: do a combination of flight and shuttle; or drive. Traveling from Sydney in July, things will get slightly colder in Melbourne: highs are around 15°C and lows about 6°C. Wrap up your sightseeing by early afternoon on the 30th (Tue) to allow time for travel back home.